In the form of a one-man show complete with humor, song and dance, drama, art and architecture, the New York production of Livin’ La Vida Imelda gives us a glimpse of recent Philippine history that might never be mentioned in history books. As the city reputed to be the stomping ground of Imelda Marcos during her heyday, New York City is awash in Imeldific productions this year. 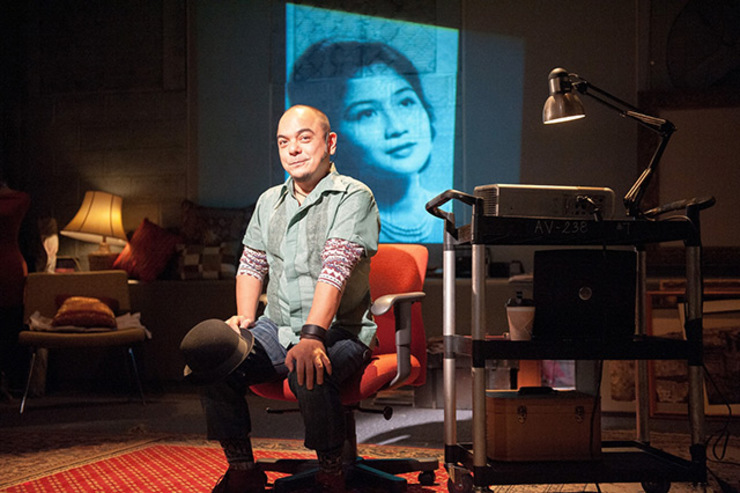 First was the disco-themed David Byrne production Here Lies Love, and now Carlos Celdran’s Livin’ La Vida Imelda is gracing the city’s theater scene until November 23rd. While it was my first time watching Livin’ La Vida Imelda last weekend, the performance actually turned 12 this year. What began as a walking tour at the Cultural Center of the Philippines Complex in Manila became a solo act after it was dramaturged in Toronto by Kapisanan Philippine Center for Arts and Culture in 2009. As a theater performance, it premiered in Toronto at Twist Gallery that same year, and has since been shown in Silverlens Gallery Manila, Art Dubai, the CCP, and now in NYC off-Broadway. What a great way to celebrate its 12th birthday! I caught the show this past weekend and walked away from it with gears spinning in my head. Fortunately, I was able to ask Carlos a couple of questions about the production, as well as his life as a performer, storyteller, historian, and activist. How do you feel about the production and about the show being in New York? Surreal. Like a dream come true. What’s hack and dork like me doing off-Broadway? I just am grateful more than anything else. Thank you to Ma-Yi Theatre Company for taking a risk on my show. What have been some of the early reactions to the show? Mostly positive. People come away with a more complex picture of Imelda. She really is more than just about the shoes. Not that I’m trying to absolve Imelda nor condemn her. I just want to paint a more nuanced picture of the Philippines and its history. There’s no denying that Imelda is one of the most internationally recognizable Filipino icons. No doubt her identity is pretty much ingrained in ours. And as long as people view Imelda as a cliché, we will be viewed that way as well. I just want to destroy that cliché. In the show, you recognize the downsides to a dictatorship and solemnly pay respects to the victims of human rights violations during the Marcos era. But you also cite the advantages of a dictatorship in having no opposition, as well as the good work that was done by the Marcoses. Some have even accused you of glorifying the Marcos years. How do you feel about that? People have said that I do not emphasize Martial Law nor the negatives enough. Well, all the horrible stuff is already out there and known by an American audience – up to the point that it pretty much is ALL that they know. My show is one hour and a half. Why waste my time in repeating things that are common knowledge already? I am not in denial of the wrongdoing. I just wish to tell the US audience things that they haven’t heard before. Like that Imelda was guest of honor of the Lincoln Center and that US was totally complicit in the Marcos dictatorship and actually SUPPORTED his decision to proclaim Martial Law. You are an open supporter of charter change. In your show, you discussed the possibility that democracy might just be for “self-actualized” people who are past the basic issues of poverty and inadequate education. How do you think a parliamentary system of government would benefit us? MUCH Better. Less Manila-centric and more regional representation. This presidential system we have now is ridiculous. It’s prone to deadlocks, petty dictators, and inaction. We currently vote for personalities and not policies. Presidential elections are pretty much winner-take-all beauty contests. We vote for personalities and not policies. That’s why we have a senate that DOESN’T represent regions – they just represent their own interests. What the hell is that about? CHANGE THE CONSTITUTION now. Parliamentary would be way more suitable to a nation like the Philippines. Your mention of the “landed classes” in your play made me entertain the possibility that they are the actual leaders of our country and what we have right now is a faux democracy where everyone has their own interests and there isn’t one true effective leader. Is this what you meant? Oh yeah. Please. Manila Golf Club controls the Philippines, not the Philippine government. We have an untouchable oligarchy class with bottomless resources and unbridled power. Big business is now controlling much of the Philippine economy and society. The power of the Philippine government is really shrinking as we privatize our infrastructure and management of government assets. We need more policies to address these issues. Or better yet – OPEN the economy and remove the 60/40 ownership provision. Let FOREIGNERS into the Philippines to compete with these oligarchs. Then we may see more jobs and better services from these lazy businessmen. What characteristics of the Marcos presidency (and Imelda’s reign) would benefit Filipino society as it is right now? We could always use a bit more arts and culture funding in the Philippines. Always. I enjoyed your show’s discussion of a country’s arts and culture as its brand and is what gets us recognition internationally. What do you think is the state of the Filipino art world right now? Why does the government fail to recognize its importance? Ever since Imelda left, most of the government and Philippine society as a whole consider arts and culture to be frivolous and Imeldific. The stigma still sticks today. No joke. Do we need another Imelda Marcos? What aspects of Filipino society would benefit from the presence of another Madame? We do not need another Imelda Marcos. We need more jobs and more foreign direct investments. Period. The New York production of Livin’ La Vida Imelda is a tremendous applause and honor for your Walk This Way tours. What have you learned about Filipinos, tourists, and the country after many years of doing your guided tours? I’ve learned that we Filipinos need to learn SO MUCH more about ourselves. The audiences of my tours and shows are 60% Filipino. It’s an honor to have my countrymen watch me, but it’s alarming because it’s an indication of how LITTLE we know about ourselves and our history. You do such great work as an activist in the Philippines. How does it feel to be one of Manila’s premiere “noisemakers” in important issues such as reproductive health, HIV/AIDS, preservation of heritage sites, and the meddling of the church? Do you find it easier or more difficult to engage people to discuss the issues you care about? It’s just another job. Hahaha! I’m just glad I don’t have to do a desk job to get by. I am truly blessed by the Universe. I can’t complain and I will not. As far as engaging people on issues, it all depends on who I am talking to. But when I do realize I am talking to a total idiot, I smile and just walk away. As much as Carlos walks away from pointless conversations and pursuits, so does he run towards meaningful ones. Returning to New York City where he spent some time in (what he refers to as the “crazier and edgier”) 1990s is like a homecoming for him. I was glad to see him this time and hear him relay his version of the Marcos years whose tail end we both saw in our younger years. We’ve both seen enough of post-Edsa Philippines to have the luxury of romanticizing a time before it. Ironically, it is the freedom of speech afforded by the democracy we now enjoy that allows both of us to tell our respective stories. Carlos’ stories are a great gift to Filipino communities all over the world. 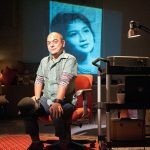 In the form of a one-man show complete with humor, song and dance, drama, art and architecture, his New York production of La Vida gives us a glimpse of recent Philippine history that might never be mentioned in history books. “How many of these stories are myth and how many are true?” Carlos challenged his audience as part of his performance I saw on a breezy autumn evening last week. If our past is merely the story we tell ourselves, then it is incredibly important to discern between truth or fiction. If not, more convenient and more self-serving stories will be told to us in place of actual history. Someone else’s version of the truth will eventually replace our collective past.